Sad News: We are saddened to hear that Frank Springer, past-president of the NCS, died April 2, 2009. Frank was a long time member and integral part of the NCS family. We will miss him, greatly. Frank was born December 6th, 1929 in New York City. He graduated from Syracuse University in 1952. Frank’s career was as varied as it was lengthy and prolific. He has produced work for political and sports cartoons, comic strips, animation, magazine illustration and comic books. 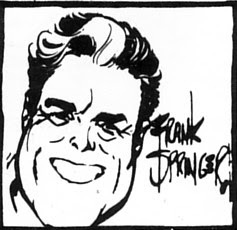 You can read some tributes and remembrances of Frank on the blogs of Mike Lynch and Mark Evanier.